This Home Depot rental pickup truck was seen driving down the bike lane on West Street in TriBeCa running down cyclists. 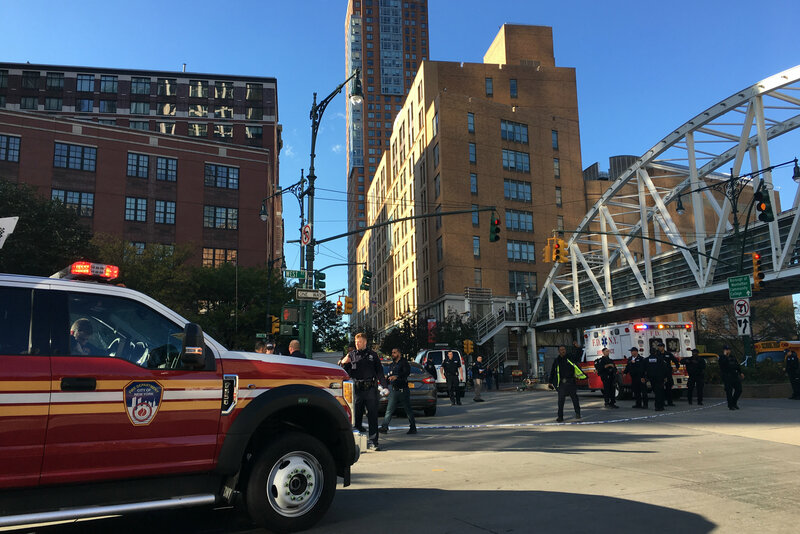 TRIBECA — Eight people were killed and nearly a dozen injured when a terrorist driving a rental truck struck multiple people during a 20-block rampage along a bike path on West Street Tuesday afternoon, officials said. 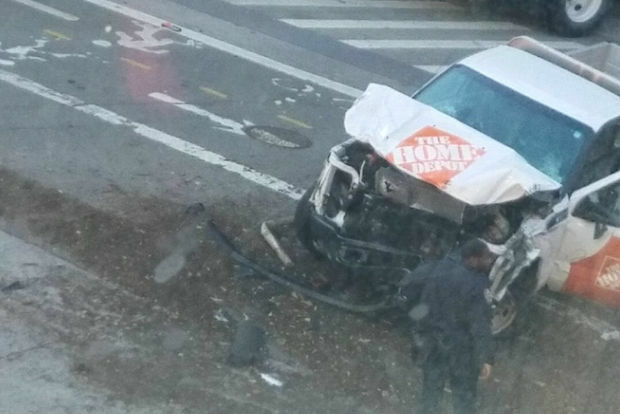 Sayfullo Saipov, 29, who is originally from Uzbekistan, drove the pickup truck rented from Home Depot onto the bike path at West Houston Street about 3:05 p.m. and started heading south, mowing down multiple people along the way, according to the NYPD and police sources. Saipov then struck a school bus at Chambers Street, injuring two adults and two children on board, before exiting the truck with a paintball and pellet gun in hand, police said. Responding officers shot Saipov in the stomach before taking him into custody, authorities said. He is expected to survive, police officials said. Eight people were killed and 11 others seriously wounded in the rampage, police said. Six of the victims, all of them men, were pronounced dead at the scene, while two others died at the hospital, officials said. Five of those killed were natives of Rosario, Argentina, celebrating the 30th anniversary of their high school graduation, according to the Consulate General of Argentina in New York. They were identified as Hernan Diego Mendoza, Diego Enrique Angelini, Alejandro Damian Pagnucco, Ariel Erlij and Hernan Ferruchi, according to the consulate. Saipov made a statement after getting out of the truck that is consistent with these types of terror attacks, NYPD Commissioner James O'Neill said at a press conference following the incident, after a reporter asked if the suspect had stated, "Allahu Akbar." “He did make a statement when he exited the vehicle. And if you just look at MO off the attack, that’s consistent with what’s being going on," O'Neill said. Gov. Andrew Cuomo joined the commissioner and Mayor Bill de Blasio at the press conference just two hours after the deadly attack. "The new terrorist tactic, which they’ve called for publicly, are these lone wolves who commit these acts of terror," Cuomo said. De Blasio called it "a particularly cowardly act of terror aimed at innocent civilians." "We know that this action was intended to break our spirit," the mayor added. "We have been tested before as a city very near the site of today's tragedy." Eugene Duffy, 43, a chef at the nearby City Vineyard, said that he just emerged from work when he heard a commotion. "I saw a white pickup going down the bike lane running people over," he said. "The guy was driving, hitting people, four or five blocks. It looks like it was intentional. Who drives down a bike path? There was no traffic on West Street." He said he saw injured cyclists on the path and pieces of Citi Bikes scattered in the lane. "I was standing over bodies," Duffy said. A student at the nearby Borough of Manhattan Community College captured videos appearing to show the suspect, Gothamist reported. Social media posts showed what appeared to be bodies on the sidewalk covered in sheets.